Since 2003, more than 260,000 Eritreans have claimed asylum in eastern Sudan and more recently in northern Ethiopia. They are largely single, educated young adults, primarily between 16 and 30 years old. In recent years, an influx of younger children has sparked some concern, as children as young as 10 years old began to flee from their country into Ethiopia, Sudan and beyond. 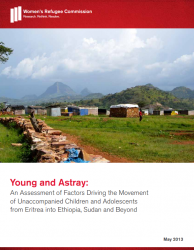 This report from the Women's Refugee Commission details research conducted to assess the push and pull factors and protection risks faced by the Eritrean unaccompanied and separated children (UASC) seeking asylum in northern Ethiopia and eastern Sudan.